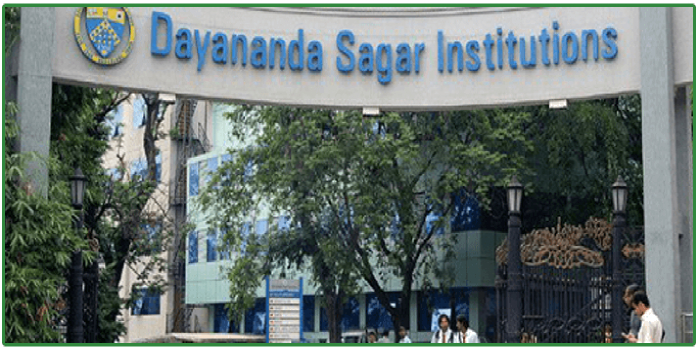 Dayananad Sagar University has announced the application to various UG PG programmes offered by the institute for the 2018-19 batch. The courses offered are approved by UGC. The exams will be conducted in 28 exam centres across the country. The different Streams under which the admissions are open include B.Tech, M.Tech, Management Studies Candidates can check the list of exam centres and the corresponding dates. Candidates who wish to seek admission at Dayananad Sagar University should go through the Eligibility Criteria and application process before applying to any particular course. Bachelor’s degree with a minimum of 50% aggregate (45% -SC/ST &amp; OBC category) DSAT(Dayananda Sagar Admission Test) score MAT/CAT/PGCET scores are also accepted. Should pass 10+2, A Level, IB, American 12th grade or equivalent and a minimum of 45% marks in aggregate. Should pass 10+2, A Level, IB, American 12th grade or equivalent with Physics, Chemistry and English with Biology or Biotechnology or Mathematics or any other Life Science subject as optional and a minimum of 45% marks taken together in Physics, Chemistry and any one of the optional subjects. A candidate who has passed B.Sc. in any discipline of Life Sciences, Biosciences or Bachelor’s Degree in Agricultural, B.E. (Biotechnology), Veterinary and Fishery Sciences, Pharmacy or Bachelor of Medicine; Bachelor of Surgery (M.B.B.S.) or Bachelor of Dental Surgery or equivalent examination recognized by DSU with a minimum of 50% marks taken together in all the subjects in all the years is eligible for admission to M.Sc. Eligibility shall be 45% in aggregate forcandidates belonging to SC/ST candidates. Should pass 10+2 examination with Physics, Chemistry and English with Mathematics or Biology as optional subjects / D Pharm or any other equivalent qualification recognized by the Pharmacy Council of India. Should pass 10+2, A Level, IB, American 12th grade or equivalent with Physics, Chemistry, Biology and English and a minimum of 45% marks taken together in Physics, Chemistry, Biology and English. Should pass GNM after 10+2 or equivalent examination preferably with Science subjects with 50% marks in aggregate Candidates should be a registered Nurse and registered Midwife or equivalent with any State Nursing Registration Council. Candidates should have completed their GNM course on or before 01.06.2018. Candidates should have passed BSc/PC BSc/PB BSc Nursing recognized by the Indian Nursing Council and a minimum of 55% marks in aggregate. Experience: Applicants must have 1 year of experience after BSc Nursing in a hospital or in a community health program or in a school or college of nursing. PB B.Sc Degree holders need to have one year experience either before or after Post Basic B.Sc Nursing degree. Should pass 10+2, A Level, IB, American 12th grade or equivalent with Physics, Chemistry, English and Biology with a minimum of 40% marks taken together in Physics, Chemistry and Biology. DSAT – is conducted by Dayananda Sagar University (DSU), Bangalore for admission to B.Tech, M.Tech, B.Pharma, M.Pharma, Pharma D and MBA. Shortlisting on the basis of DSAT. Your Dayananda Sagar University, Bangalore brochure has been successfully mailed to your registered email id .